Click below for information about joinging our great volunteer crew! Volunteers have kept us thriving for more than 70 years. So donate your time, talents and treasure to keep us going! 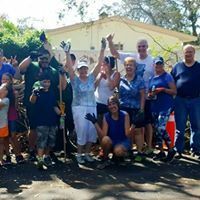 From a garden clean up after a hurricane to helping with a familty art class, we can use your help. Along with helping to bring art and nature to everyday life while honoring those who have served, you'll meet lots of likd-minded people! Don't worry about it looking like a shopping cart. That's how we keep track of your donation of time. Click for details and to sign up to volunteer!